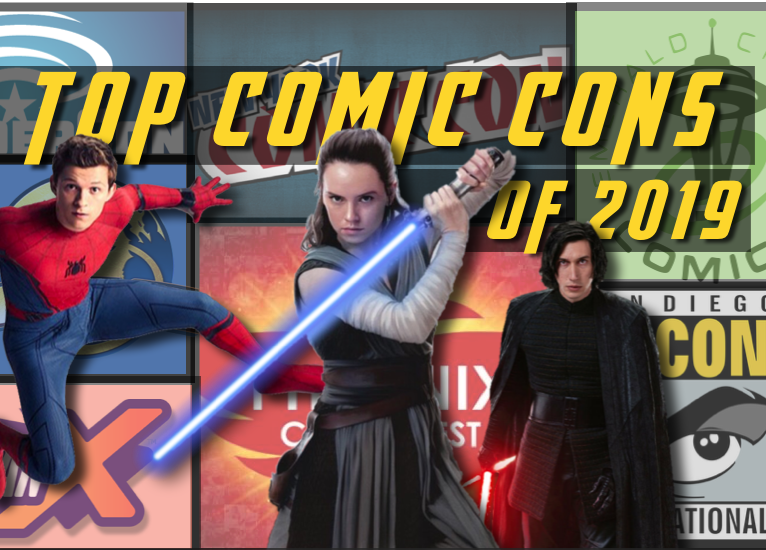 Below, we’ve pulled together a graphic resource list of the biggest and most influential comic book and fan conventions in the country for 2019…. most of them you may know. We’re not necessarily saying that these are the best conventions–although they may very well be–but we’re saying that these conventions currently have the most buzz about them. Click on each graphic below to find out more. Emerald City definitely earns its reputation as one of the most respected conventions specifically showcasing comic books and comic book creators. Part of the ReedPop family of conventions, C2E2 is one of the biggest conventions in the midwest, and also a stop on the Cosplay Nationals tour. Wondercon is definitely one of my favorite conventions. It’s one of the best convetnions for Cosplay, for networking, and for a ton of classes for industry insiders. PLUS, it’s across the street from Disneyland. As the final Star Wars Celebration before the epic conclusion of the 9-picture Skywalker saga of films, this is shaping up to be one of the most exciting celebrations in the galaxy. Too bad it’s almost completely sold out (Monday tickets still available). Don’t fret, though–they usually broadcast many of the biggest panels and celebrations on StarWars.com all weekend long. Salt Lake Fan X, which was formerly known as Salt Lake Comic Con before San Diego Comic Con sued to force them to change their name, is one of the biggest independent conventions still operating–and one of the most respected because of their ability to attract a stellar lineup of guests. This convention has exploded in attendance and popularity in just a few short years, owing in no small part, we’re sure, to it’s prime vacation location. Everyone wants to go to Orlando–might as well attend a con while you’re there! Make sure to check out its Tampa cousin too. This convention topped out above 100,000 attendees back in 2016, but then in 2017 an armed man entered the convention with the intention of seriously hurting one of the guests. Luckily, this nutcase was caught before he could carry out his plans, but the security snafus and other changes suppressed the attendee numbers last year. Here’s hoping that Phoenix Fan Fusion comes roaring back. The grand-daddy of comic book conventions celebrates its 50th anniversary this year. With a packed (and completely sold out) house year after year, this convention is still the place to be beat. It has the most entertainment industry support of any of the cons, and a reputation for providing the best experience of anybody–no wonder that San Diego Comic-Con continues to be the envy of the con world. Dragon Con continues to earn its reputation as the party con, with events and parties planned in all the hotel rooms every night. But here’s the difference–Dragon Con remains a fan favorite because it’s an event BY the fans and FOR the fans. It is perhaps the single most fan-centric con of them all…. put it on your bucket list. The crown jewel in ReedPop’s crown is New York Comic Con, which claims to have sold 250,000 last year. That’s an astounding number, although if you break it down into a daily sum, that’s about 60,000+ per day. Which is STILL a very large number. Regardless, it’s one of the best-attended cons by both fans and industry people, including TV, movies, comics and any other popular entertainment folks. We call it the Beast in the East.. This started out as Stan Lee’s Comikaze, God rest his much-loved and much-missed soul, but soon became what it is today: Los Angeles Comic Con. And in just a few short years it has rocketed up to over 106,000 attendees in 2018. WOW. But strangely, it never really feels that crowded. And although it still has some growing to do to fill up all the space in the Los Angeles Convention Center, this is a con Los Angeles can be proud of. It doesn’t have the star power or the panels of some of the more established conventions, but it soon will.